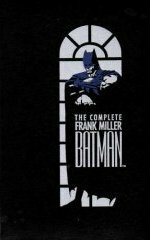 Continuing my recent foray into graphic novels, I picked up The Complete Frank Miller Batman from Amazon Marketplace. If you're unfamiliar with Frank Miller's work, you might have heard his name related to Frank Miller's Sin City: a movie from 2005 with Jessica Alba, Bruce Willis and Mickey Rourke. My copy of The Complete Frank Miller Batman arrived quickly from "lawschoolbookdiscount" (via Amazon Marketplace). The day I received it in the mail, I read "Batman: Year One" immediately. It's a story about Batman's origins and Bruce Wayne's first year as Batman. Jim Gordon's story of becoming commissioner (though he doesn't make commissioner in this story) is told along with Batman's. Gordon starts his new job with the Gotham police force and immediately finds how corrupted it is. Batman starts his career as a crime fighter at the bottom going after petty thieves but he quickly moves to going after the corrupt politicians and crime bosses. Each of them struggles in their new roles. Batman is constantly being hunted by the police (including Gordon) as they seem him as a threat. Towards the end, Gordon sees that Batman is trying to save people, not cause problems and their partnership begins. It's very clear that Batman Begins used elements from this story including Gordon waiting for Batman on a rooftop to discuss a new villian: the Joker. "Wanted: Santa Claus - Dead or Alive" is a small diversion in between "Year One" and "The Dark Knight Returns". In my opinion, it could have been left out. It's a short story about a reformed criminal working as a department store Santa. He is forced to help his former colleagues rob that store. It's so short, it's worth the read and it shows Miller's early illustration work. Now the main event: "The Dark Knight Returns". The story takes place in the not so distant future. Bruce Wayne supposedly died in a racing accident. Batman's been away for 10 years (after the death of Jason, the third Robin). Gordon is set to retire. Gotham is in chaos. Reflecting on the death of his parents and his vow to rid Gotham of criminals, Bruce slides into becoming Batman again. During his first outing as Batman, he says, "I should be a mass of aching muscle... but I'm a man of thirty -- of twenty again." The Dark Knight's return to Gotham seems to awaken Joker from his "coma" in Arkham. Most of the press and the police see Batman as a vigilante menace who supports his followers in their forceful ways. In reality, Batman had no involvement with his fans and followers: they were acting on their own. The Mutants (and to some extent, the Sons of Batman) are sending Gotham deeper into chaos and destruction. And Joker isn't helping things. Batman picks up a new Robin along the way: Carrie Kelly. She ends up saving him when he's beaten by the leader of the Mutants and Bruce welcomes her as his new Robin (knowing he needs the help). The story winds up in an epic battle between Superman, the boy scout, and Batman, the menace. Superman's been sent by the US President to bring Batman in, but knowing Bruce as he does, Superman knows he'll have to kill him. I was totally enthralled with "The Dark Knight Returns". Some of the reviews I've read say that Frank Miller's story single handedly renewed interest in Batman and the comic book industry as a whole in 1989. I can see why. The story was gripping, intense and exciting. The illustrations (done by Miller and Klaus Janson) were dark and very well done. Miller brings Batman back as a dark, almost anti-hero: a man who sometimes even crosses that line between good and bad. It's a MUST read for Batman fans. And, I'll certainly read more of Frank Miller's work as I can.